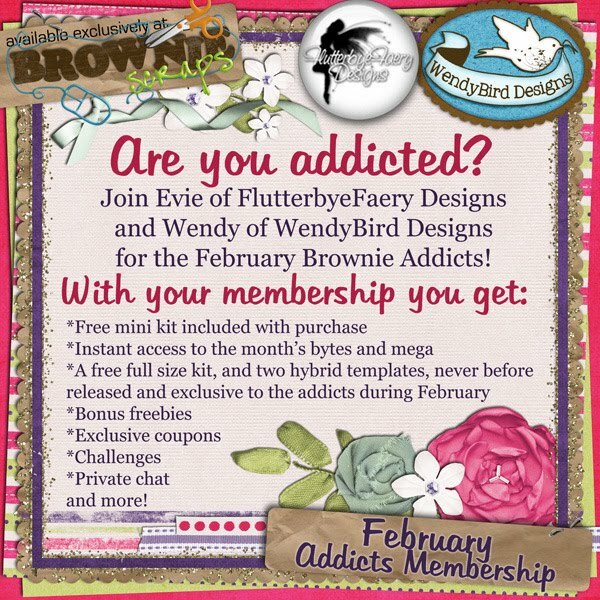 FlutterbyeFaery Designs: Wanna win a February Addicts Membership? Wanna win a February Addicts Membership? 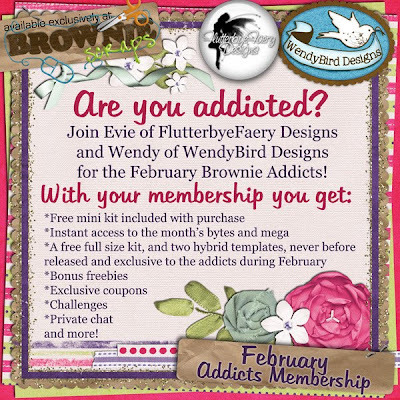 WendyBird Designs and I are hosting February's Addicts! It's going to be a lot of fun! Kits, coupons, hybrid projects and more! You won't want to miss it. You can purchase a membership for only $7 now. But wait! I said you could win a membership! That's right! Just post a comment here about your favorite thing about February and Monday I'll be back to give one lucky poster a free membership! Want a second chance to win? Visit Wendy's blog, she's giving away a membership too! What I love about February is that it's the last month before Spring. but also the fact that we can go out and play in the snow, and of course Valentine's day! All the love you feel during that month! But what I love the most is February is the month two years ago we found out we were pregnant with our son. and he's the best thing in the world! I love to celebrate Valentin´s Day with my hubby and the carnival here in Germany. I love to see the flowers grow after the winter. We have a lot of birthday in our big family in February. That´s so much fun! I'm one of those people who likes the weather in Feb! It can be either stormy (cuddle with fire and hot chocolate time) or beautiful spring like days some of the bulbs blooming with a promise of a new beginning. And of course there is Vanentine's day too! What do I love about February? I love the weather, I love doing all of the fun crafts for Valentine's Day, and it's just one of my favorite months. I like February because we always take our vacation to Florida and see family. It's also my daughters birthday so not only do we go to Florida, we also have her party down there where it is warm! Thanks so much for the chance to win! My favorite thing about February this year is my new house will be finished and we get to move out of this shoebox townhome! Yay!!! What I love about February is Valentines Day. I love doing all the crafts with my grandkids and baking valentine cookies and cupcakes for the grandkids to decorate.